Mmmm… I love dill pickles and always wanted to try making them (especially since the organic ones are so expensive), but until recently I had never tasted a homemade pickle that I actually liked! I don’t like them sweet, or tasting of pickling spice, I just want a good, garlicky, Kosher dill pickle. Well, last year I finally found the recipe I’ve been looking for, and they taste as good as the best Kosher dills you can buy. If there’s an open jar in the fridge, my kids will polish them off in no time, usually placed atop a nice thick slice of cheddar cheese. Wash cucumbers. Soak in ice water for at least 2 hours (this makes the pickles crisp). Refresh ice as needed. Sterilize as many 1 quart canning jars and lids as you will need in boiling water for 10 minutes (I usually do an extra one, just in case). Combine the vinegar, water, and pickling salt in a large pot and bring to a boil. 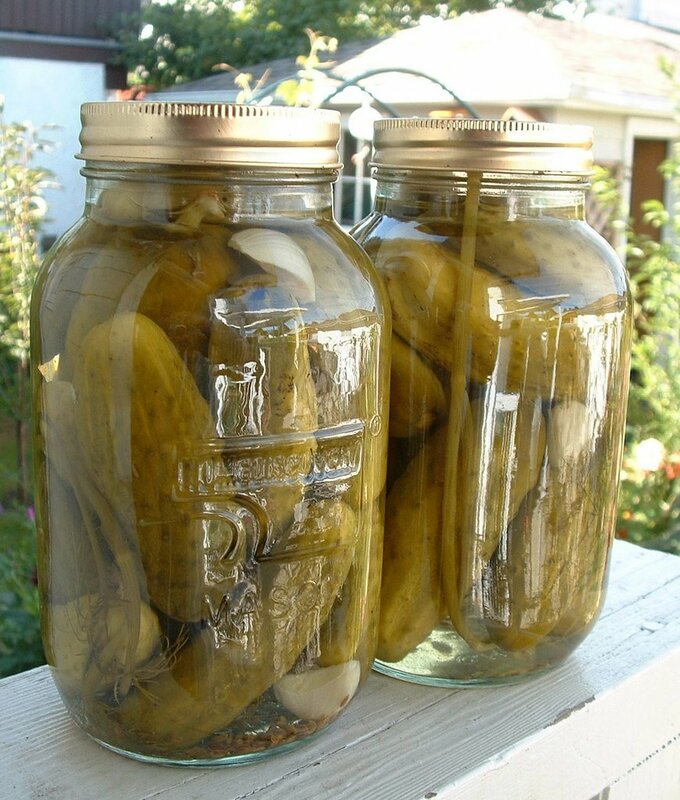 In each jar, place 2 half-cloves of garlic, one head of dill, then enough cucumbers to fill the jar. Then add 2 more garlic halves, and a sprig of dill. Fill jars with hot brine. Seal jars, wiping rims to remove any residue. Store pickles for at least 8 weeks before eating (good luck with this part, I don’t think we lasted more than a couple!). yummy, dill pickles. I was unable to can mine, had to reuse pickle juice from last year. Few more months in the fridge and we will be able to eat ours. I have never canned anything, and so want to. Where do you get brine salt? You should be able to find pickling salt at any grocery store or wherever you would find canning jars and supplies. I actually just used Kosher salt when I made mine, though. Good luck with your canning – I was happy to discover that it wasn’t as scary as I thought!